Will HR Outsourcing ride the Third Wave? There’s a common belief that the third in a series of ocean waves is the biggest. If it’s true for waves of change in HRO too, this latest wave of transformation in the industry will have a considerable impact. According to Anthony Hesketh in HRO Today transformation is back on the Outsourcing agenda, if indeed it ever went away. We all understood the logic of the first wave of HR Outsourcing in 1999 – freeing up HR to focus on strategic aspects of the job, introducing standardization, self-service technology and Global Service Centers. It was this desire for HR Transformation that created ground-breaking Global HR Outsourcing deals with Exult-BP and ePeopleserve. Back then HR consultants from the Big Four, heading for the exit, process-map and SLA template in hand, myself included, could be heard muttering under their breaths ‘every last large organization will want an HR portal and centralized HR service’, (while they hungrily signed-up to their dot.com share-options). Of course they didn’t.Innovation is a tricky business. Potentially great ideas get ignored because markets are too small, or the change doesn’t fit other people’s business models or match existing values. Sounds familiar? The second big wave of change in HRO contracts came around 2006, including Unilever-Accenture, Johnson & Johnson – Convergys. These didn’t quite deliver our dream of pre-configured, hosted and e-Enabled services either. Instead, the services they offered were bespoke, tailored to clients’ demands and the particular nuances of their HR Operating Models. Still they had some success, given the industry grew to be worth billions of dollars. In response to the economic meltdown of the last few years, organizations began thinking again, developing new business strategies, and new operating models. The HRO industry consolidated. Outsourcing contracts lasting a decade were thin on the ground when organizations couldn’t see where they might be themselves. Out of this has come the third and potentially most significant wave of transformation for HRO. The focus for HR has shifted to employee productivity and engagement, deploying the right skills at the right time, mergers and acquisitions, and developing staff. HR needs to transform itself and the way it operates in order to deliver, enabled by organizational structures and processes better aligned to the businesses it serves. A greater share of the HR responsibility needs to be carried by line managers too. The question for HRO vendors and HR Executives is what role will HRO play in the move to new HR operating models? One way will be through more standardized HR services. HR needs to demonstrate value for money. Can a business justify providing employees with a personalized HR service when competitors get good results for less money using self-service processes. If HRO vendors can provide standardized services with user-friendly tools then there will be a sea-change in HR Operating Models. HRO providers can also offer web-based tools to enable improvements in collaboration, productivity and managing the workforce. Delivering these tools, allowing buyers to avoid large upfront costs and access to the best solutions is an attractive proposition. Those HRO vendors who provide tools and services that help address organizations’ key talent management issues will thrive. Watch out for innovative market entrants building rapid market share with a credible HRO/SaaS model. Transforming HR is about changing how people work and behave, not merely changing systems and processes. Having worked on both sides of the HRO vendor/buyer fence, I have seen opportunities where skills gaps in managing change, managing vendors and transformation programmes could have been bridged. HRO vendors have been reluctant to share (or sell) their change management skills and can play a significant role in the move to new HR operating models by sharing their experience, knowledge and skills with organizations. HRO will enable a leaner corporate function, by reducing central transactional HR work, pushing out more ‘people management’ to managers enabled with much better skills and tools. The onus is on HRO providers to be innovative and enable more self-service, for example by utilizing mobile devices for time-recording, checking schedules, benefits, vacancies. HR Transformation is not back. It never went away. For HR executives to benefit from cost savings and to achieve their strategies, they will need to accept increasing standardization. Industry consolidation, technological innovation, economic pressures will all help to make this happen, and we could see HRO take off. All change is disruptive, outsourcing in the HR industry included. The early innovators of HRO had the right ideas at the wrong time. Now the conditions are right for it too. This article was originally published in the Spring 2011 edition of HRO Today, by Andrew Spence. This entry was posted on Monday, September 12th, 2011 at 8:58 pm	and is filed under HR Blogs, HR News, HR Operating Models, HR Outsourcing, HR Strategy, HR Technology, HR Transformation, Leadership. You can follow any responses to this entry through the RSS 2.0 feed. You can trackback from your own site. It think what we are seeing is the natural evolution of both HR organizations that have outsourced, HRO vendors, and other HR organizations that are assessing outsourcing as an option. Organizations that have already outsourced the mundane now require new and improved ways to increase efficiency, enhance productivity, strengthen their talent pool, and ultimately add value to the organization as a whole. Senior management recognizes that these HR groups have added value (in most cases) by outsourcing but that was in the past, and they are asking ‘what have you done for me lately?’. These HR groups have tamed the backend processes and essentially removed the chaff they can see that there are other processes to improve as well but they don’t want all of the pain and cost of the original outsourcing project. This gives rise to the new and improved HRO providers. To stay relevant with current customers they are offering more strategic services while improving their technology and streamlining their own internal processes to decrease operational costs. All the while new potential customers armed with the knowledge of previous outsourcing success and horror stories (assuming they have done their homework or have procured an advisor) are reviewing outsourcing vendors with a more critical eye. These new customers are demanding dramatically improved processes, enhanced functionality and greater efficiency gains at a lower price point. Those vendors that cannot keep up with the pace of technology and new/current customer requirements will fail. Those that can support what the new customers require will also improve their offering to their current customers and thrive. These companies, in my opinion will drive the next wave of HRO through innovation. How Will Blockchain Impact HR? The Quantified Workplace: Technology vs Trust? Managing Attrition - Are You Looking Backwards or Forwards? 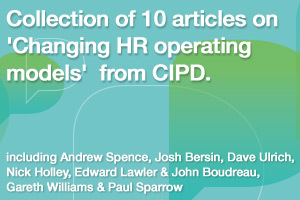 Is Your HR Operating Model Fit for the Future ? HR Robots: Transformers in Disguise? "Top 30 Global Influencers in HR Tech of 2018"
Kennedy Research includes Glass Bead Consulting in its report "HR Transformation Consulting 2015"